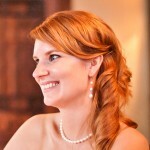 I often times struggle with what to make for the appetizer and champagne course of a dinner. It needs to be something light enough to not make you too full for the pending dinner, yet also needs to provide a base in the stomach to handle the onslaught of alcohol the stomach is about to receive. As I looked back upon the dinner party database which records everything I’ve ever made for a dinner guest (yeah that’s right…), I realized I basically had one good appetizer dish in the repertoire and that was all. Now the dish I had been using for 90% of dinner parties is indeed a good one. And if you’ve never tried it, I urge you to do so. Even if you don’t have guests coming over, these make a great snack or meal any time of the day. The main ingredients are cheese, butter, and flour. Pretty hard to go wrong there. I’m speaking of course of the Classic Gougeres. Gougeres are historically from the Burgundy region of France. Earlier forms were sometimes made with animal blood and prepared in a sheep’s stomach. Fortunately today’s version is much more benign and easy to prepare. But after literally years of eating these at every dinner party I hosted, I decided it was time for something new. Apparently a new trend in the foodie realm is the savory cookie, a baked concoction with the visual markings of a cookie and the savory ingredients of an appetizer. David Lebovitz from Chez Panisse has seaweed cookies, The New York Times has their olive oil cookies, and even Martha Stewart has ham and gruyere thumbprints. For my own experiment I decided on Chocolate & Cayenne cookies and Parmesan and Rosemary cookies. Both recipes are very classical cookie dough recipes with a little less sugar and a lot more flavor. 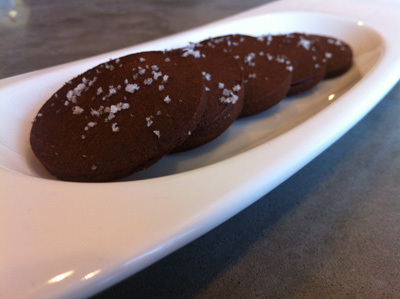 The Chocolate & Cayenne cookies rely on a sprinkling of fleur de sel for an immediate savory cue followed by a hint of cayenne that hits you in the after taste. 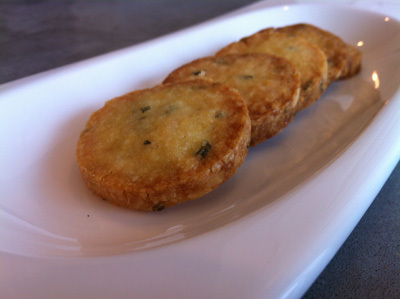 The Parmesan Rosemary cookies taste almost like a shortbread cookie but with an unmistakable saltiness from the Parmesan and herbalness from the rosemary. 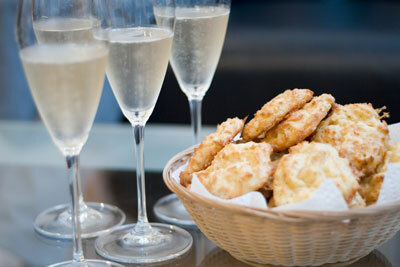 I had both of these this weekend with Champagne or Sparkling wine and they were a great match. Substantial enough to ensure the sparkling doesn’t go right to your head and light enough to leave plenty of room for the next four courses. Try them out for yourself. At 20ish minutes of active time, an hour of freezing, and 15 minutes of baking, they are very quick and easy. What’s best is that the dough can be frozen for up to two weeks and the cookies can be baked up to three days ahead of time. The perfect start to a dinner party for you and your guests. You had me at “appetizer and Champagne course.” My husband and I are anticipating hosting more dinner parties this year and my go-to appetizer tends to be something on toast. This is fine, but I want to step up my game and any of these seem straightforward enough but unique enough to offer a bit more intrigue. 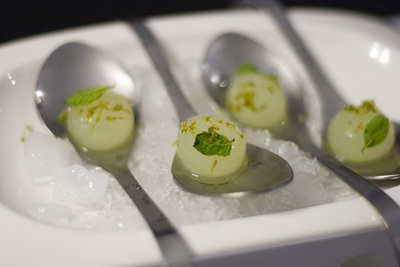 Not going to lie–I’m also pretty excited to try the mojito spheres too!